Zac Madison, Offensive Line, East Liverpool, Sr.
Marky Thompkins, QB, East Liverpool, Sr.
Malcolm Wade, Offensive Line, East Liverpool, Sr.
Mikey Williams, Linebacker, East Liverpool, Sr.
Marky Thompkins, East Liverpool, Sr.
Mikey Williams, East Liverpool, Sr.
Zac Madison, East Liverpool, Sr.
Marky Thompkins, QB/RB/Strong Safety, East Liverpool, Sr.
Mikey Williams, RB/Outside Linebacker, East Liverpool, Sr. This was not the year that Senior QB Marky Thompkins had expected to have. However, reality is what it is and halfway through the second game of the season he suffered an ankle injury that forced him to miss the rest of that game and 4 more games as well. In spite of that setback he still managed 94 rushes for 493 yards for a 5.2 average and score 6 touchdowns rushing. 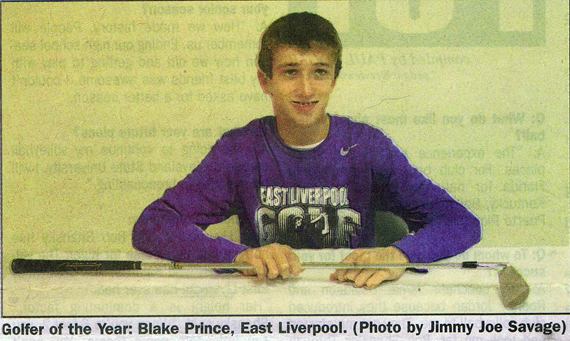 His passing stats for the year were 21-51-3, for 286 yards and 3 touchdowns. There was at least one punt return for a TD during the year. Total career rushing yards = 1949* yards. Total career Passing Yards = 2346* yards. *These stats have to be checked since they may be higher. We are not sure that Marky's last game against Weirton was figured in them. In that game he scored 4 TDs, gained 106 yards on 5 carries, completed 4 of 5 passes for 107 yards including a 30 yard TD pass to his younger brother, Revel Tompkins who is was a Sophomore this past season. He also returned a interception for a TD. Marky would be the first to tell you he didn't accomplish that in a vacuum. There were a lot of teammates along the way that played roles in making that happen but Marky, obviously, played a major role in it as well. Congratulations Marky. The ELHS Volleyball team set records this year in winning more games than ever in school history and advancing further than ever before in tournament play. ZANESVILLE -In the words of Paul Simon, "Time it was, and what a time it was"
The East Liverpool volleyball team's dream season came to a close in an Ohio Division II Regional Final against Columbus Bishop Hartley Saturday afternoon at the Winland Memorial Gymnasium at Zanesville High School. The Hawks defeated the Potters in three games, 26-24, 25-15, 25-13. 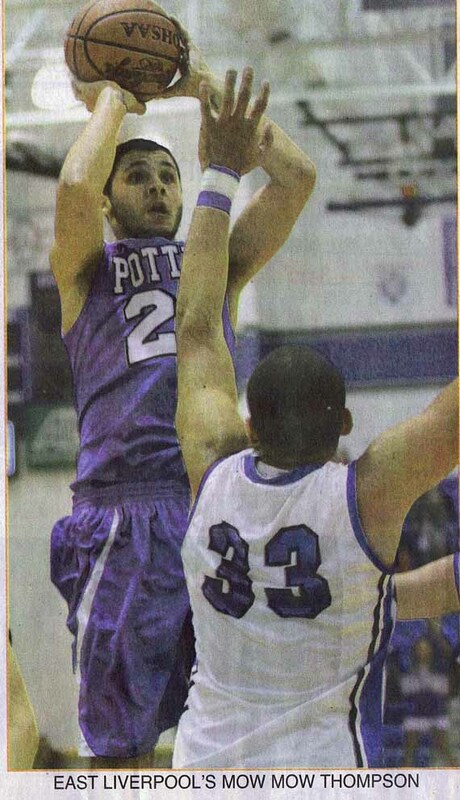 With the loss, the Potters ended their stellar season with a record of 25-2. 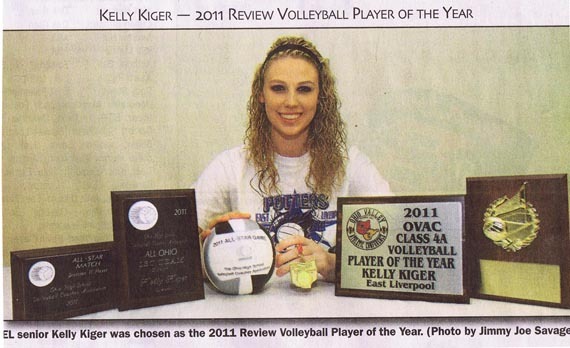 Kelly Kiger, East Liverpool, Sr.
Whittni Davidson, East Liverpool, Sr.
Kelsie Wymer, East Liverpool, Sr.
Taylor Jordan, East Liverpool, Jr.
Allison English, East Liverpool, Sr.
Mallory Waggle, East Liverpool, Sr.
Blake Prince East Liverpool So. Joey Cilone East Liverpool So. 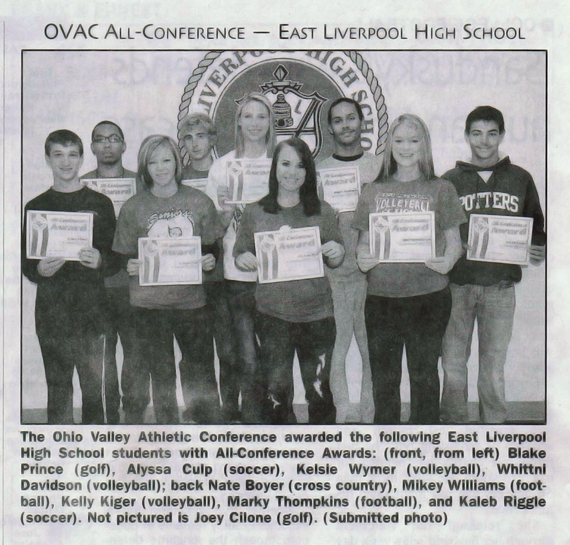 Alex Watson East Liverpool Jr.
Nate Boyer East Liverpool Jr.
Jake Densmore East Liverool Fr. Emily Kotfis East Liverpool Jr.
Jordi Warrick East Liverpool Sr.
Kaleb Riggle East Liverpool Jr.
Alyssa Culp East Liverpool Sr. Courtesy The Review, Friday, December 9, 2011. Mow Mow Thompson, EL, Sr. The 2011-2012 Associated Press Eastern All-District Boys and Girls Basketball Teams. 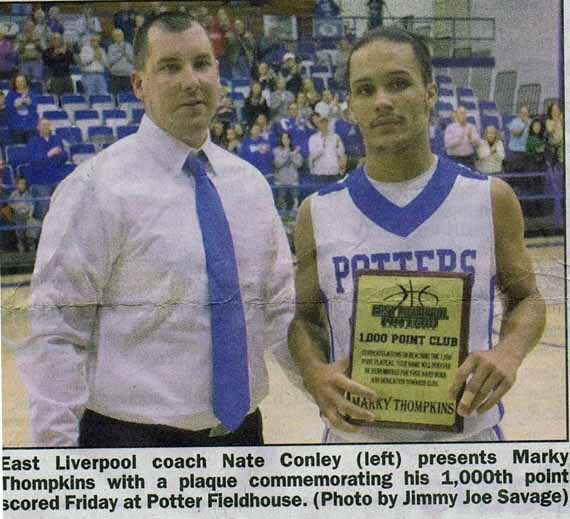 Friday night January 7, 2011, in a game against Youngstown Cardinal Mooney, Marky Thompkins became only the 7th member of the ELHS Basketball 1000 point club. 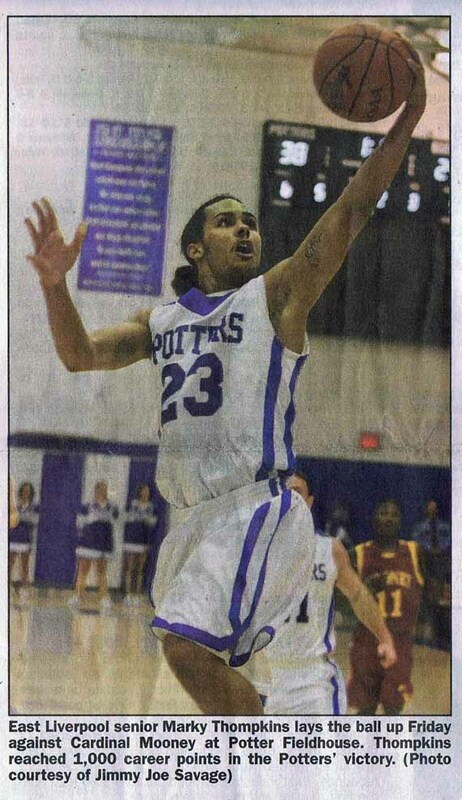 The Potters were 10-0 at home. 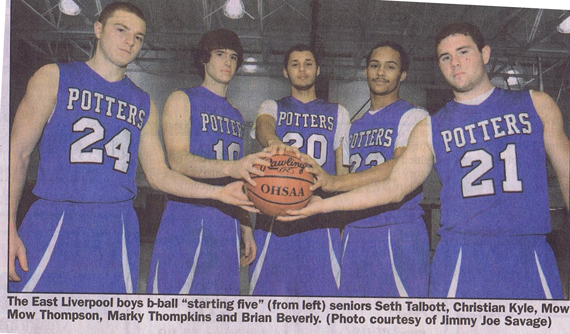 The Potters won the Ohio Division II Eastern District Sectional Co-Final played at Ohio University in St. Clairsville. The Potters Lost to St Clairsville in the OHSAA Div. II Eastern District Final. The Potters ended the season with a 19-4 overall record. 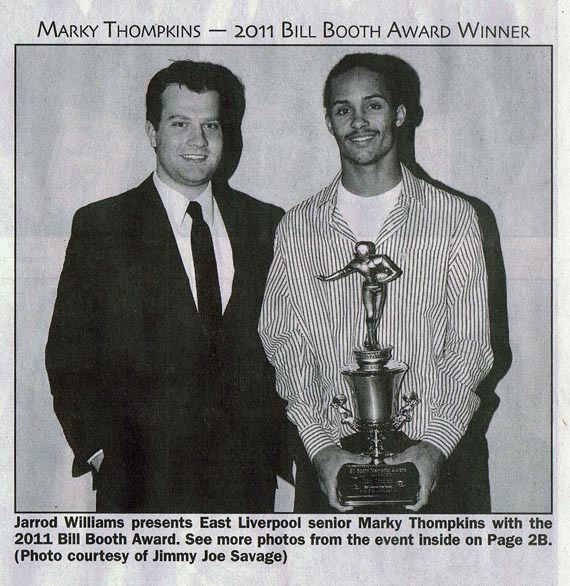 Marky Thompkins and Mow Mow Thompson will play in the annual Samuel A. Mumley OVAC All-Star Basketball Classic which will be played April 1, 2012 at Ohio University-Eastern in St. Clairsville.